Cameron Winklevoss dissects “The Social Network,” and discusses how Facebook is only the first chapter in a story that will be defined by Olympic and entrepreneurial achievement. Part one of a two-part series. This Sunday, David Fincher’s The Social Network has a chance to sweep the Oscars. The highly acclaimed film about the founding of Facebook has already won a slew of awards, including a gaggle of trophies at BAFTA and the Golden Globes. But for all the winning and success associated with Facebook, it’s easy to forget that for some out there, the movie and social network represent an unforgettable loss. We recently spoke with Cameron Winklevoss, one-half of the now-famous “Winklevi” twins, who are ensnared in a seemingly endless battle with Mark Zuckerberg over the origins of Facebook. discuss Julian Assange, Steve Jobs, America, and Mark Zuckerberg’s performance as CEO of Facebook. Fast Company: In your own online profile, you describe yourself in the bio section as an Olympic rower, a graduate of Harvard, and as a character featured in the motion picture The Social Network. Are you concerned about being remembered as the guy in that movie who almost invented Facebook? Cameron Winklevoss: Not at all. First of all, I’m perfectly happy. I’m happy with the way that myself, Tyler, and Divya have conducted ourselves given what we’ve had to deal with, both with Mark Zuckerberg, and everything else involved with the whole thing. In short, I believe we were portrayed in the movie as people. If anything, our biggest flaw is that we’re encumbered by a sense of morality that is far too often–at least in the world of The Social Network–not present. I’m more than okay with that. The people who are calling this movie fiction are the people who have a lot to worry about. The public record and the lawsuits and all the complaints show that it’s in fact a reality, and a reality that they don’t like. But what’s sort of most disappointing is that they’re not upset with the way they behaved; they’re simply upset that the story is being told. Do you ever worry about your legacy? With respect to our legacy, this is just one chapter in our lives. It’s interesting how the Olympics have become subordinate to this whole thing. And I understand the fascination with the story, I get that part, I see the interest there. But I just see it as one chapter. We’re just getting started. We’re looking forward to 2012, the second Olympic games. Then after that, who the heck knows? Will it always be a part of our person? Absolutely. But will it be the defining aspect? We’ll just have to see. At the end of the day, I think there is integrity in the type of characters that we represent. And I say that knowing full well that there are a lot of people who misconstrue the character as a blue-blooded person who has a sense of entitlement. That is not only incorrect for me personally, but I think it’s an incorrect reading of the movie and the screenplay. There’s just nothing in the movie that connotes that Tyler, Divya, or myself have any legacy or attachment to Harvard, and that we’re not there by anything other than our merit alone. I can see how people may have incorrectly concluded that, because we have an old-fashioned sense of morality. But that doesn’t mean we’re part of some older establishment. We are just as much a part of the new establishment as Mark Zuckeberg, which people seem to ignore because it doesn’t make sense for the narrative they want to weave. Zuckerberg grew up in Dobbs Ferry. This is a nice area of New York. He went to boarding school at Philips Exeter Academy. You can’t get a finer education at a private boarding school. Then he went to Harvard. He’s not some underdog. The entitlement of the story is that Zuckerberg thought because he’s the computer guy, he was entitled to the idea and entitled to the whole thing. Regardless of who you are, I believe that everybody in this country is entitled to justice. That’s the entitlement that our characters believe they have: justice. I would hope that people don’t come away from the movie believing that Zuckerberg is the underdog. if you’re rooting for Zuckerberg, you’re rooting for a lawless place, a place where fraud is acceptable, a place where there is no protection. You say that The Social Network is non-fiction. But come on, there’s no way the parties at Harvard were that crazy, right? That’s a good question. I’m sure in the history of Harvard, and the history of most schools, there’s been some pretty crazy parties that I’m not even sure you could even capture on film how silly and ridiculous they were. But I will say the following. I don’t know if that particular debauchery happened in that way. There were some pretty funny stories. You know: It’s college. People do funny things. I actually spoke to David Fincher after the New York film premiere and I was joking with him about that party. He was saying that it was supposed to be over-dramatized because it’s the fantasy that’s going on in Zuckerberg’s head about what he’s missing out on. That’s the idea. So it’s not supposed to necessarily be that this is a reality at the Phoenix Club. If you were the inventor of Facebook, wouldn’t you have invented Facebook? Isn’t there some truth to that? The line is a seductive argument. The short answer is: We would’ve invented Facebook if Mark Zuckerberg hadn’t sabotaged our project and absolutely betrayed us. It’s really easy to forget six or seven years later that Mark Zuckerberg’s big vision, before we came to him with our idea, was comparing photos of Harvard students to farm animals. Not only is that not creative, not only is it not unique because HotorNot.com already existed, but it’s goddamn cruel and mean. Other co-founders of Facebook have moved on and become involved in projects from startups such as Quora and Qwiki. What are you devoting yourself to? We’re definitely looking at a couple different things, but nothing that I can publicly talk about. I wish I could say more, but right now, that’s all I can really say. 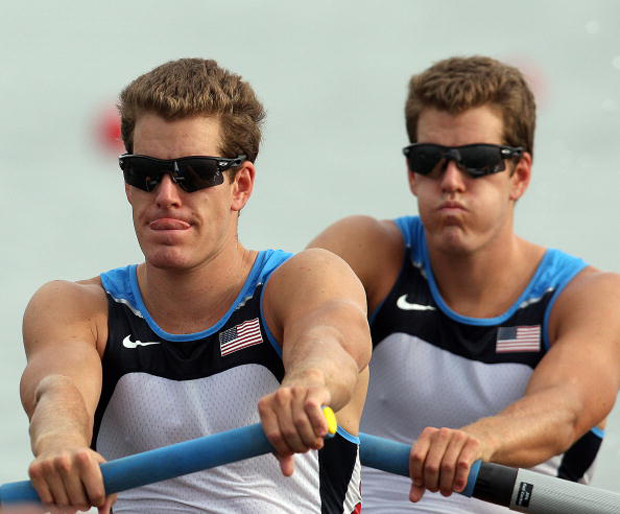 We are training for the 2012 Olympics, but obviously we’re not going to row forever. I think we’re entrepreneurs at heart. Would you rather win a gold medal at the Olympics or get recognition for inventing Facebook? Well, can’t you have both? I will say that rowing in the first Olympics was probably one of the most proud moments in my life. What I enjoy about the sport is that it’s definitive. Nobody can take away from the fact that you’re an Olympian. It’s indisputable. You get there on merit, and merit alone. I feel that the way Mark operated, and what he did, was completely unethical and completely against teamwork. That’s not something you find in the sport. People like that don’t get very far. They get nowhere really. One thing I don’t believe I am at all is bitter. I’m certainly disappointed with the way certain people have acted. But it doesn’t color my outlook or view of the world. Your questions have alluded to: What is my life like after the movie? I make sure not to confuse the movie with my accomplishment. It’s the accomplishment of the screenwriters and the director. They created that piece of work. Obviously, it’s based on my life, but I don’t confuse it for something that it’s not, or with the the fact that there are a lot of interesting stories out there. Make no mistake: There are lots of other great and interesting stories out there. Ours just happened to be made into a movie.